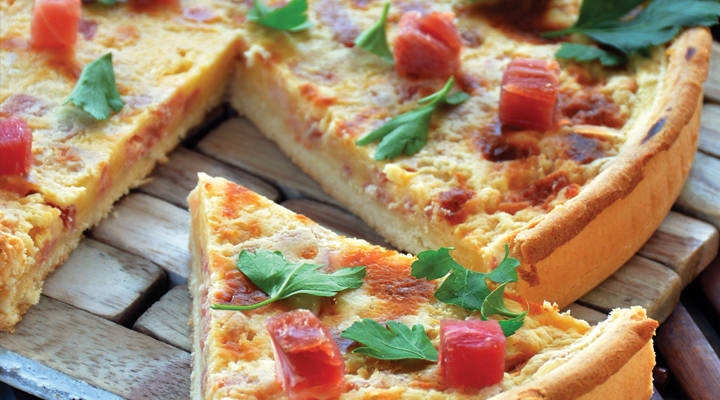 This healthy and delicious quiche makes for the perfect midweek meal. 1. To make the pastry, sieve the flour and xanthan gum into a large mixing bowl and add a pinch of salt. Rub the butter into the flour mixture until it resembles very fine breadcrumbs. Add the egg and just enough ice-cold water to bring the mixture together. Knead the pastry gently to bring the dough together. Shape into a disc, wrap in cling film and rest in the fridge until required. 2. Grease a 21cm loose-bottomed fluted flan dish. Roll out the pastry and line the dish with it. Place in the fridge to rest for another 15 minutes. 4. Line the pastry with a triple layer of grease proof paper and fill with dried rice, lentils, chickpeas or beans. Bake in the oven for 15 minutes, then remove the paper and the weights and bake for a further 8 minutes, until golden. (Keep the dry ingredients for future blind baking, as they are now no longer suitable for cooking.) Set aside on a wire rack. the bacon and onion until cooked through, then spread them over the base of the pastry. 6. In a separate bowl, beat the eggs, milk and cream together with the seasoning. Pour this savoury egg custard over the bacon and onion filling in the tart case. Top with the tomato halves and sprinkle over the cheeses.